That growth made TTC the top technology company in the Fantastic 50 this year. The company’s revenue rose 1,123 percent from 2009 to 2012. Rojas and Vella opened the company in 2005 after working together in the telecommunications industry. At the time, they were working as subcontractors, Rojas with the Transportation Security Administration (TSA) and Vella with the Department of Homeland Security. All the while, the two were building and marketing their company. They landed their first prime contract in 2009 with the TSA to provide SharePoint content. SharePoint is an information management collaboration tool. “We got very good reviews on our performance and they increased the size of the contract,” Rojas says. The company provides an array of information technology services such as network design and installation, custom application, software and database development, data center networking, communications design and installation, mobile application development and Microsoft SharePoint. TTC also offers content management and customer solutions through the Microsoft product. The company’s contracts are split evenly between the Department of Defense and other federal government agencies. It also works with a limited number of commercial customers. 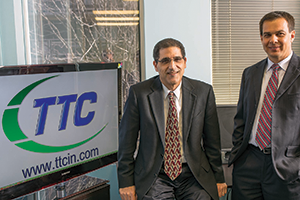 Last year, TTC won a major contract with the Centers for Medicare and Medicaid Services (CMS) to deploy and train its staff on SharePoint and to develop content management applications. Earlier this year the company won a contract to provide video teleconferencing support for the U.S. Army Training and Doctrine Command. “We are supporting a four-star general in that project,” Vella says. The company continues to develop new lines of business, adding a project management arm as well as a SharePoint training and development arm. “We hope that will lead into other IT training and projects,” Vella says. TTC also is discussing mobile application projects with various government agencies. It has developed mobile apps for commercial clients for several years. “It will be an additional line of work for the company, and it will add extra value for the agency. It’s a win/win,” Vella says.